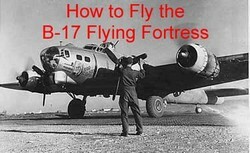 How to Fly The Boeing B-17 Flying Fortress DVD covers the famous B-17 Flying Fortress bomber of World War II. Included are five B-17 training films and the B-17 pilot's manual on the DVD. The Boeing B-17 Flying Fortress was a four-engine bomber developed for the U.S. Army Air Corps. First flown in 1935, the B-17 Flying Fortress proved durable in WWII bombing missions to Germany and was able to survive amazing punishment. The B-17 was the classic example of flying fortresses during WWII. There were several B-17 models produced, each of which improved on the Boeing B-17 defensive and offensive capabilities. With (13) .50 caliber machine guns in front, side, aft, top, and bottom turrets, the B-17G was truly a Flying Fortress in the air. The B-17 fortress dropped over one-third of all bomb tonnage dropped on Germany during World War II. The first four films on this B-17 DVD are How to Fly the Boeing B-17 in Four Parts. These four very detailed films were produced as a set for new pilot training by Boeing Aircraft, and are presented in an easy going, pilot-to-pilot format. This is the complete original 2 hour, four part series -- not an edited summary. Film #1 - Part 1:Ground Operations. Actor Arthur Kennedy takes a rookie pilot through a complete preflight check, including exterior and interior check. Then, you'll be guided through the instrument clusters, which are visible in detail, to become familiar with key gauges & control systems. Finally, the easy-to-understand hands-on dialogue between instructor and pilot leads you through the complete start up procedure, including control check, engine start, and run up. In B+W with a run time of about 34 minutes. Film #2 - Part 2 Flight Operations. Part 2 takes up where Part 1 left off with takeoff, flight characteristics and landing. An entertaining animation shows the importance of proper attitude in the B-17 bomber during takeoff, and once again, you'll see a hands-on demonstration of the proper use of all instruments and control systems during the flight. In B+W with a run time of about 29 minutes. Film #3 - Part 3: Emergency Operations. This film is literally a hot stove session where veteran pilots give hands on advice on how to overcome some of their most challenging B-17 emergency situations. You'll learn how to handle dangerous situations like in-flight engine fires, CG-induced flight instability, stalls, emergency small field takeoffs & landings and more. In B+W with a run time of about 25 minutes. Film #4 - Part 4: The Induction System. Your admiration for the knowledge and skill of Fortress pilots will soar when you learn all about how to manage the B-17s complex and temperamental Turbo Supercharger system. Animations provide a detailed, yet easy to understand, explanation of the theory and practice of the proper operation of the interdependent elements of the big Fort's high altitude breathing system. A gear head's delight! In B+W with a run time of about 23 minutes. Film #5 - B-17 25 Hour Inspection. This fascinating film, also produced by Boeing, is told from a B-17 crew chief's perspective. You'll literally get under the skin of the mighty Fortress as skilled mechanics perform comprehensive 25 hour maintenance and check out everything from flight control system cables and spark plugs to oil filters and turret operation. In B+W with a run time of about 28 minutes. A 109-page B-17 pilot's manual is included on the DVD. It is in .pdf file format with photos, systems diagrams, performance charts, procedures & more. The manual can be accessed on a computer equipped with a DVD drive. The B-17 DVD is in NTSC format and region-free. It is packaged in a plain clear plastic C-Shell DVD case without paper graphics.